The Nehalem River is an Oregon Coast gem that includes critical habitat for some of the best wild salmon and steelhead runs left in the Lower 48. It has long attracted Oregonians to hike, fish, camp, and float its clear waters. 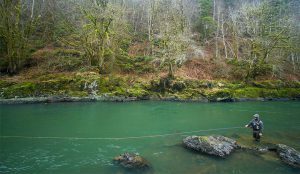 It’s also the North Coast’s longest river, aside from the mighty Columbia, and the Nehalem watershed includes important tributaries like the crystal clear Salmonberry River. The Oregon Forest Conservation Coalition is working to designate the stunning 17-mile river segment from Henry Rierson Spruce Run Campground to the Cougar Valley State Park as a State Scenic Waterway. The Scenic Waterways program was passed by ballot measure in 1970 in response to dam construction, suction dredge mining, and increasing development pressures on Oregon’s iconic rivers. It allows the state to reserve our natural waterways for their scenic, habitat and recreation values. After several rivers were initially designated, the program became largely dormant until 2016. Currently, only 22 river segments are designated as State Scenic Waterways in Oregon, which equates to less than 1% of the state’s rivers and streams. The Nehalem is an ideal candidate for the designation, with old native forests, stunning trails, scenic waterfalls, and fish and wildlife habitat. 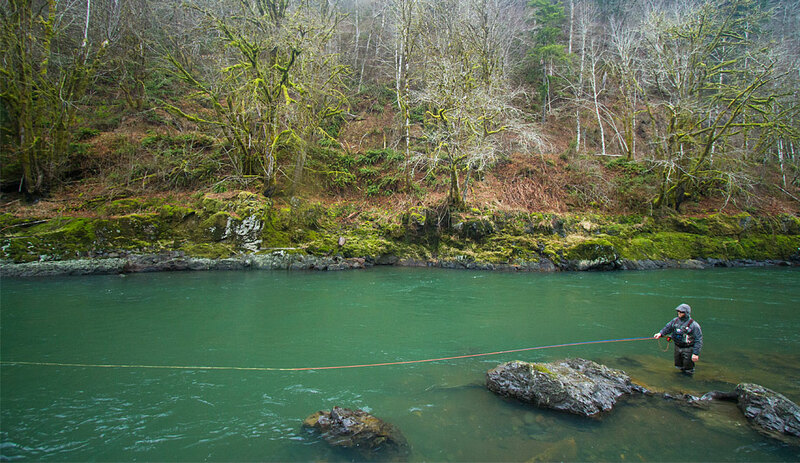 The Nehalem is the largest “wild fish only” river on the Oregon Coast and is home to an unusually rich diversity of salmonids: three races of Chinook, some of the last chum on the coast, cutthroat trout, coho, and a race of extra large winter-run steelhead. Older forests along this stretch are also important habitat for endangered marbled murrelets, which nest on the limbs of big, old trees. Unfortunately, the Oregon Department of Forestry has recently proposed a large timber sale which would clear cut sections of the proposed scenic stretch. The Oregon Forest Conservation Coalition has asked the Department of Forestry to defer the timber sale in the river corridor and further review the proposal to open more than 750 acres of older forest to clearcutting in the region. 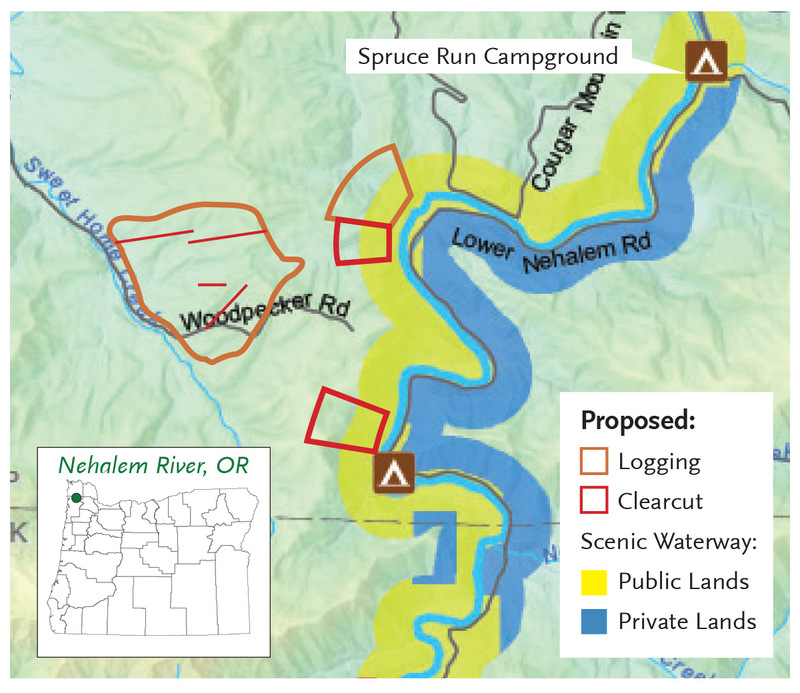 If the Department of Forestry pursues the timber sale in the proposed Nehalem Scenic Waterway, it would not only be harmful to important salmon and marbled murrelet habitat, but also to the public who hike, fish, camp, and float the clear waters. 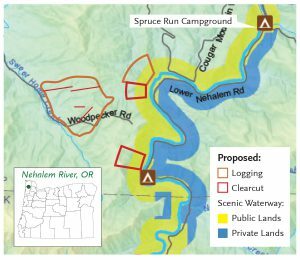 Our partners at Trout Unlimited and Wild Salmon Center have also been asked to sit on an Oregon Parks advisory committee, which will help develop a management plan for the potential Nehalem Scenic Waterway designation. We will continue to work to further our conservation efforts and ensure that our rivers and forests are protected for clean water, wildlife habitat, and special places to recreate in. The designation of the Nehalem River as a State Scenic Waterway will be an important step on that journey.